Thought the Risk-Reward or the Reward To Risk ratio is another important aspects of trading, it is more often than not completely misunderstood and might even be misleading for market participants. So to clear the water a bit in this article we try to show the reason of it. Different people use and interpret the Risk-Reward differently. The quantitative analyst and portfolio manager uses statistical models and know what is related to the Risk-Reward ratio and uses the correct mathematical mechanism to make the estimates. Since it is related to standard deviation in a specific distribution the professional can see the correct ratio and make the proper action and decision based on that. The broker, who sells a selection of assets or suggest buying opportunities, often relates to Good Risk-Reward characteristics or simply good risk reward, to entice potential buyers, without really knowing the details. It is because it is not in his deepest interest to know the details, or it would be a lot of work to really know the details. The trader, especially the intuitive trader usually do not have time to go deep into statistical analysis to find out the true, objective risk / reward characteristics of a given situation. Here lies the biggest danger. This is one important reason many traders simply lose money, even though he / she might play only good Risk-Reward situations / setups in his trading practice. I highlighted the trick in this whole exercise.The real problem is that the trader believes something, that actually has nothing to do with reality. Ultimately this false belief without real knowledge might lead to big consistent losses. Hey, I can suggest you the best Risk-Reward of a lifetime every week! Just buy a lottery ticket for Five dollars, and play for the 5 million dollar prize every week. Would you play this one to a million Risk-Reward instead of the 1 to two, one to three? If you are really smart, than you would probably not play that every week, unless you are really poor and desperate to grab the only (close to zero) probability to get a real life. 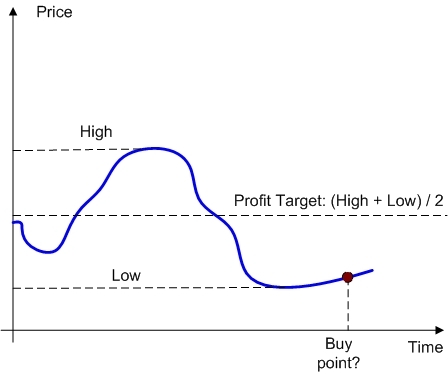 The Reward to Risk ratio (Assuming that you place your Stop level just below the Low price and profit target at the midpoint of the Low – High range.) would be about five to one, based on this chart. Would you buy this setup at this point? We go on and describe further the situation. 1. The chart above is the 10 Year chart of a big multinational technology company, which is already extremely entrenched in all world markets and saw its stock price erode during the past three years due to increasing competitions and due to the fact, that its products got commoditized. Though the stock price got some lift recently due to general market condition improvement, but the company does not have a bright future profit – growth potential, except staying in the market and paying divided. During this daily session we already saw the price three percent above current levels, and now the stock is gaining momentum again, obviously regarding valuations there are a lot of market players, who consider the fair value of this stock a bargain at this price. We know that stock charts are so-called scale independent charts, so without actual time-periods the time-frame of a given chart could be anything, the chart could still be a real, valid historical chart. demonstrate the Reward to Risk with this example. Would You buy this chart setup at this point? - Yes, I would buy the first situation. - Yes, I would buy only the second situation. - Yes, I would buy both situations. - No I would Not buy any of these situations. What is Your reason, behind your decision? At least for us the reasoning is dictated by the statistics. And what did it say above? Nothing. For this reason we would not buy any of these situations. We know nothing about potential rewards and especially nothing about the probability, that the price will hit the mid–price of the chart. The main reason, that the Reward to Risk ratio is misleading or mostly damaging for many market players is that they do not have statistics, probability numbers about reaching their profit targets. It is completely worthless without those win probability numbers. For this reason we would highly suggest to use something else instead of the Reward to Risk ratio in situations, when we have no available probability, and even if we have it, we might prefer to use expected profit calculations or profit factor calculations. Since the only surely controlled amount is the Risk (Assuming that we entered a STOP order into the brokerage account.) it would be better to use the Risk / Total trading capital to play the markets, and risk only a predefined maximum of 1 – 5% of our capital, depending on which time-frame we are playing. Assume, that the chart is the intraday 5 minutes chart of a high tech multinational, which is a true market leader. The market in a strong multi-week uptrend, and the market, and along with it this stock pulled back in these situations for the third day in a row. The stock has a 0.85 correlation with the market index, and the market internals are definitely improving, huge buyers showed up on the market pushing up most of the sectors during the day in the last 30 minutes. During these situations, the market moved up 78% of the time after a two days pullback in the strong uptrend and reversed the direction. Would you buy the stock at the market “Buy point” having all these data available? I would say Yes, also knowing the undefined “Market internal improvement” means, that the market did not change direction for the next 30 minutes 85% of the cases. Not buying for another 3 hours, but buying for at least 30 minutes. data or win probabilities to plug into the calculations. real picture, if statistical supportive data is missing. background information to support decision making.